How are the photographs obtained? The New Zealand War Graves Trust enters into contracts with experienced photographers who are provided with the detailed research on individual graves and who must meet a professional standard of photography. Where can I see photographs of a family member, friend or colleague who died in war? Access is free through this website which will eventually be associated with the “Cenotaph” website of the Auckland War Memorial Museum. The website www.nzwargraves.com has been created by Koda Web thanks to a grant from the Lotteries Environment and Heritage Committee. Why not use volunteers or people on holiday to take photographs at our cemeteries? It is crucial to have a uniform quality of photography for use in the professional design of the website and for the creation of a national archive. The Trust has always considered it unlikely that the project would be completed in a timely way if it lacked control over the provision of images, given the remote or obscure location of some burials, and if it relied on the research of volunteers. In a letter of support, Auckland War Memorial Museum director Roy Clare CBE wrote: "We consider the work the Trust is doing to create high-resolution images of an archival standard to be of national value and importance." The photographs will principally show the headstone or memorial of each individual serviceman or servicewoman. There will also be photographs of the cemeteries and the surrounds. As at March 1, 2014, we expect the website to contain in the near future the majority of more than 27,000 images which had been taken up to the end of 2013. On completion, the full archive will have approximately 90,000 images available through the website. Is there a complete Roll of Honour that is accessible by the public? The collection of photographs the New Zealand War Graves Trust gathers of the war graves and primary memorials of New Zealanders will create a virutal Roll of Honour which can be accessed by the public through our website. This will be available progessively on this website. Is the New Zealand War Graves Project an official project? Although a private initiative by a small group of New Zealanders, the project has the support of the Prime Minister, the Minister of Arts, Culture and Heritage, the leaders of most political parties in New Zealand, the Chief of New Zealand Defence Force, the Royal New Zealand Returned and Services’ Association (RNZRSA), the Secretary-General of the Commonwealth, the Commonwealth War Graves Commission, the Auckland War Memorial Museum, local authorities and charitable foundations who have given grants to the project. To photograph all the war graves and primary memorials of New Zealanders who, serving with New Zealand and Allied forces, died in conflicts, from the Anglo-Boer war (1899-1902), to the present-day and in peacekeeping operations. 2. To create a digital archive and database, accessed via a website, enabling free public access to biographical information and images. A primary memorial is the principal burial reference for a war casualty where there is no known grave, for example for those of naval personnel lost as sea or soldiers buried anonymously in a mass grave. Can I get copies of the photos that have been taken and will it cost me anything? Photos are available for downloading from this website by a click of a button. The copies are free. The New Zealand War Graves Trust as a registered charity applies for funds from charitable trusts, foundations and other funders or sponsors for each step of the project. Our first grant was from Veterans Affairs, in 2006, as a “Year of the Veteran” initiative. What is the project going to cost? The original budget was, at 2006, $1.2 million, including research, photography and creation of the archive, database and website. This was based on a three-year schedule. There have been some increases in costs since our original estimates. Does this project duplicate what other groups or authorities are doing? This is the only New Zealand project dedicated to a complete photographic and biographical record of New Zealand’s war casualties and is the most comprehensive approach to this goal. For example, the Ministry for Culture and Heritage looks after war graves in New Zealand and the Pacific but it has no present plans or funding for a website with photographs of them. Why isn’t the Government doing this project? The New Zealand Government is correctly the official keeper of New Zealand’s war records and associated activities but has no specific mandate for such a global photographic project. Where are the war graves? Our research to date, as at March 1, 2014, shows the largest numbers are in France (8402 including those who served with other Allied forces), Belgium (5013 including those who served with other Allied forces), Egypt (3062), Italy (2162), Turkey (2448), the UK (2577), and New Zealand (3682). In some places there are only one or two graves – the Faroe Islands, Malawi and Bermuda, for example. How many war graves are there? From our ongoing research, as at March 1, 2014, there are 32, 934 New Zealand war casualties in war graves or on primary memorials in 87 countries. 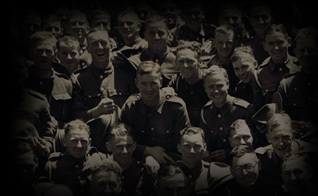 Our research to date has also identified more than 2000 New Zealanders serving with other Allied forces. Where can I get to see the photos that have been taken? Many of the photos that are available have been uploaded onto this website. As at March 1, 2014, more than 27,000 images gathered to date represent nearly 84 percent of the project. You can search for the photos by entering the name of a casualty or cemtery in the Search bar. What is a war grave? The New Zealand War Graves Trust is also commemorating war casualties by photographing primary memorials. A primary memorial is the principal burial reference for a war casualty where there is no known grave, for example for those of naval personnel lost as sea or soldiers buried anonymously in a mass grave. The New Zealand War Graves Trust follows the war graves definition of the Commonwealth War Graves Commission for World War One and World War Two. The Commission's registers for World War One list all those who died on active service between 4 August 1914 and 31 August 1921, and for World War Two between 3 September 1939 and 31 December 1947.
Who are the people in the New Zealand War Graves Trust? The Patron is Rt. Hon. Sir Don McKinnon ONZ, GCVO. The trustees are Derrick Bunn, Dennis Kerins, Rebecca Macky, Vincent Lipanovich, Dan Stevenson and Brett Fotheringham. Auckland War Memorial Museum director Roy Clare CBE is ex officio an advisory trustee. For more information on the people of the New Zealand War Graves Trust see here.